Staff members at Bartow Middle School will be able to earn bachelor’s, master’s and doctoral degrees in education at no cost, as part of a $4 million grant awarded to Polk County Public Schools. The federal School Improvement Grant Cohort 4 (SIG 4) was awarded late last year to help Bartow Middle School improve its grade. It is paying for a variety of initiatives, such as professional development for staff and computers for students. On Wednesday, during a staff meeting at the school’s cafeteria, district leaders announced the grant will also help employees continue their education. “When we look at increasing student achievement, of course we’re going to focus on the students and the supports we can deliver to them to help them perform better academically. But our staff members are a huge factor in the student achievement equation, too,” said Superintendent Jacqueline Byrd. Bartow Middle School staff — including teachers, paraeducators, administrators and educational personnel — will be able to earn a bachelor’s, master’s and doctorate in education from Florida Southern College. 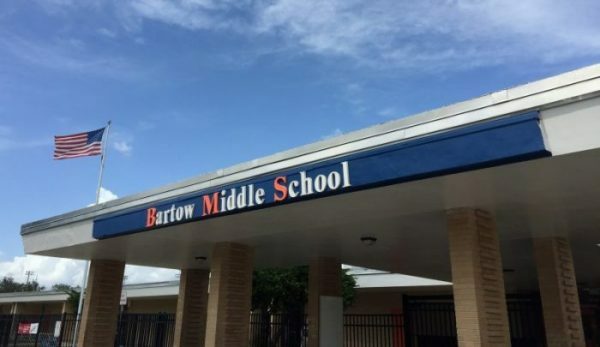 The school district and FSC are partnering to offer classes through a blend of online and face-to-face instruction that will take place at Bartow Middle. The district will reimburse the cost of their tuition, as well as their books, each semester using funding from the grant. Employees will be able to start taking classes in January. “It’s very true that education is the one thing no one can take away from you once you earn it,” said Tracey Tedder, dean of FSC’s School of Education. By Wednesday afternoon, nearly 60 staff members had signed up to express their interest in participating in the first cohort. Among them was Candyace Arnold, who teaches sixth-grade history. “This is wonderful. I was going to wait to go get my master’s, until after my daughter graduates with her associate’s degree, because of finances. I think this is a sign from God that I need to do it now. This is an opportunity,” she said. “It makes me feel appreciated, that at the end of the day they (the school district) care about us,” she said.